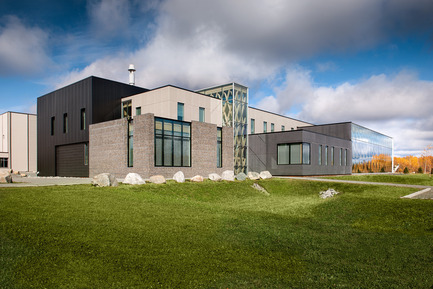 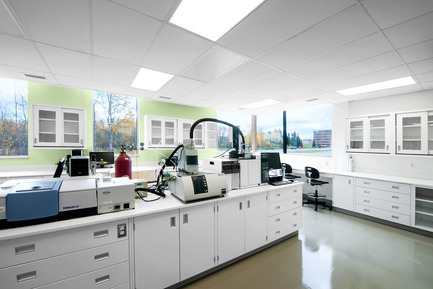 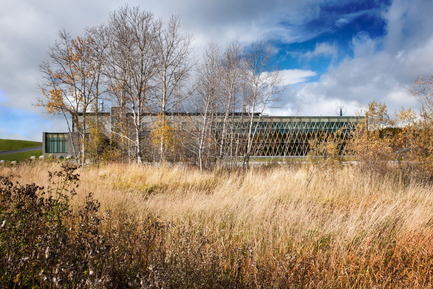 The CTRI is a new research building on the site of the Abitibi-Témiscamingue Cégep (equivalent to a Junior College) dedicated to recycling industrial residue and other underutilized resources. 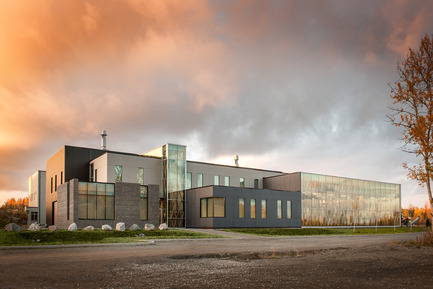 The building was designed to accommodate research laboratories specialized in three sectors: the mining industry, the biomass industry, and environmental engineering. 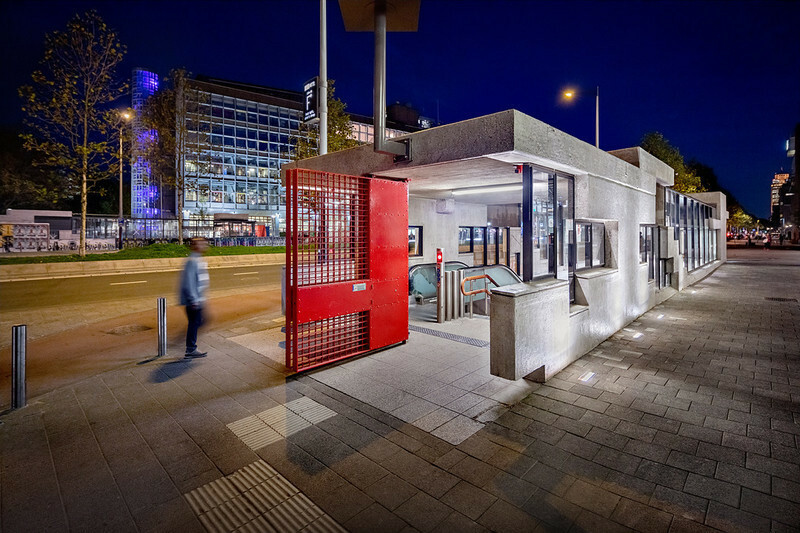 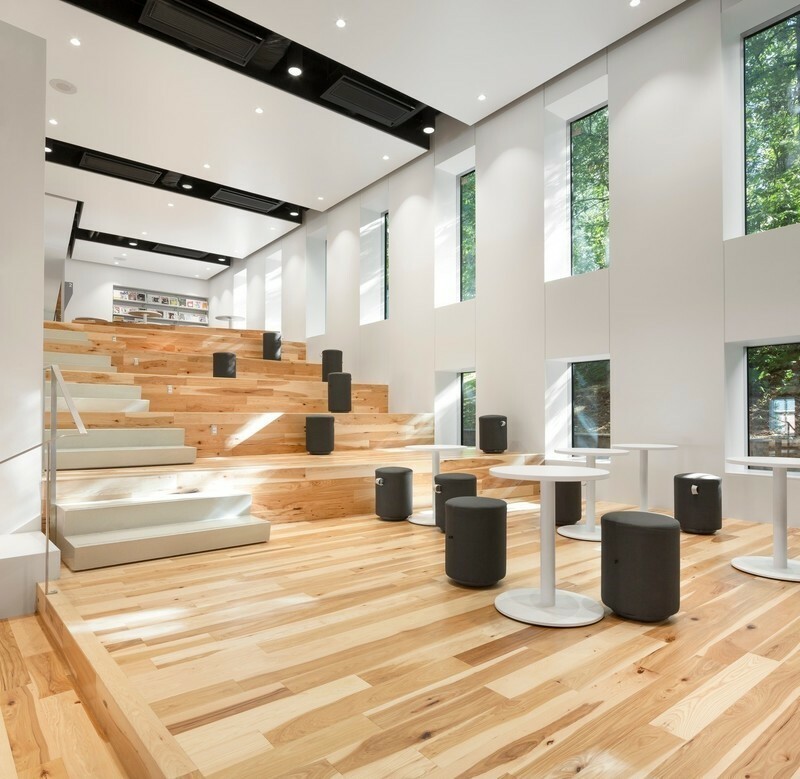 In addition, it features offices for administrative staff and researchers and various public areas (conference room, kitchenette, service areas). 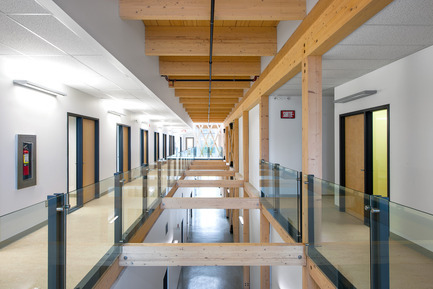 The project also included the interior renovation of part of the main Cégep building. 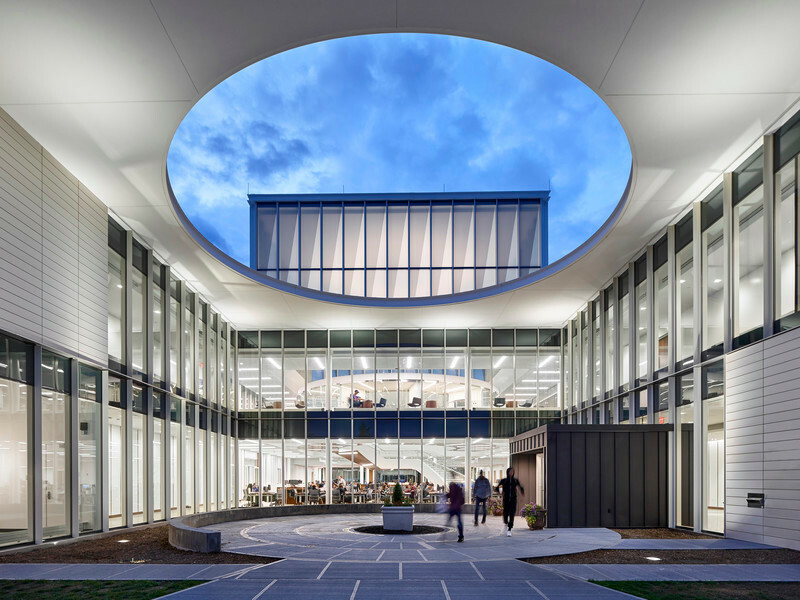 CTRI’s directors and staff wanted a sustainable, contemporary design with its own visual identity, helping to distinguish the building from the rest of the campus. 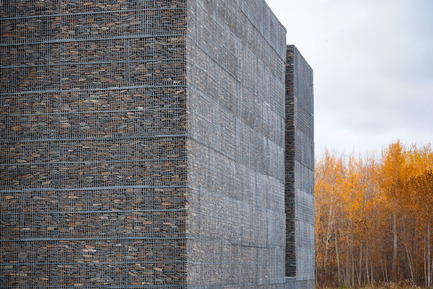 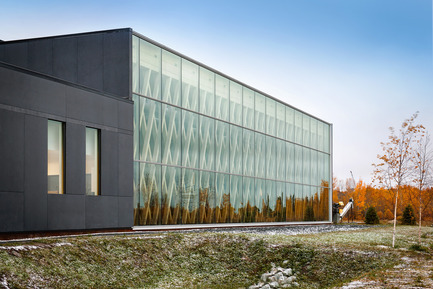 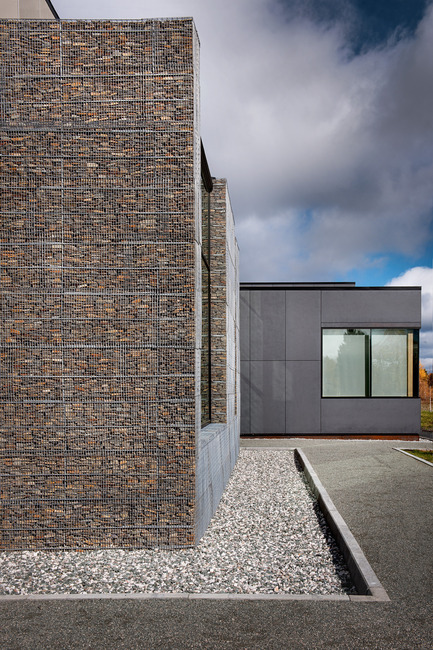 The architects responded by creating three main building volumes, each with its own choice of materials, evoking the three orientations of the research institute: metal skin for the mining sector, fiber-cement panels for the biomass sector, and stone gabions for environmental engineering. 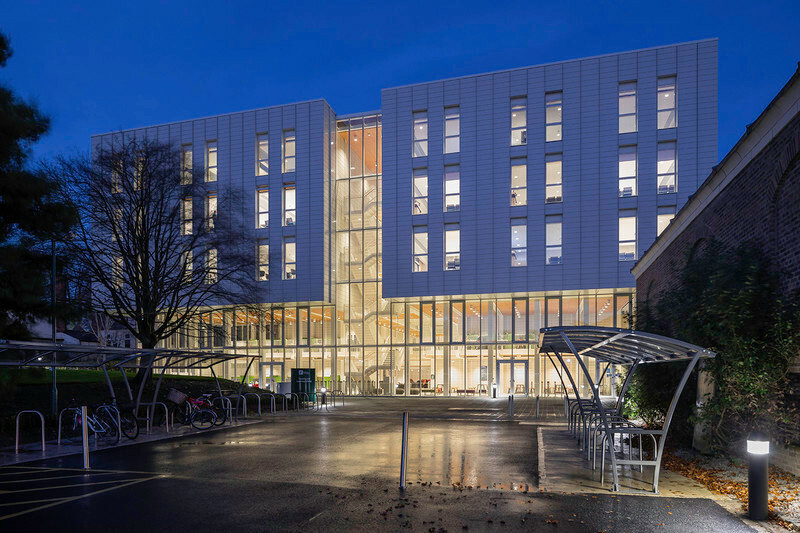 These three areas were connected by a wide corridor, open to a double-height glazed space on both levels. 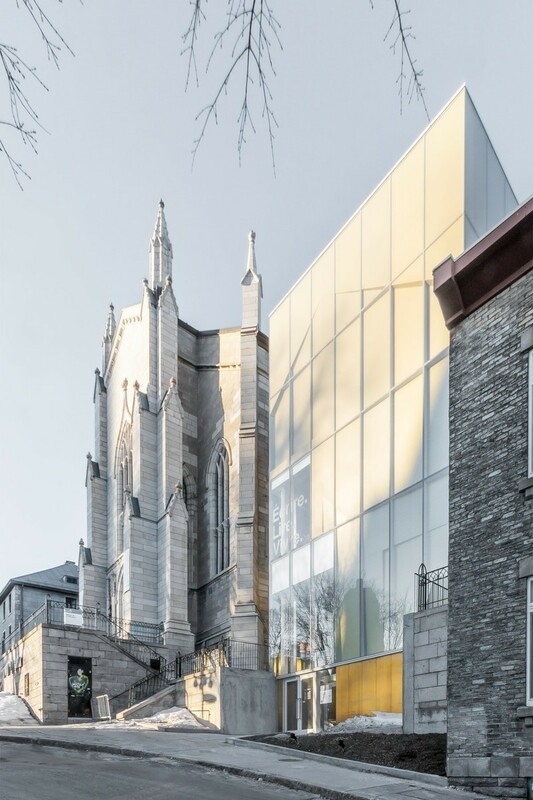 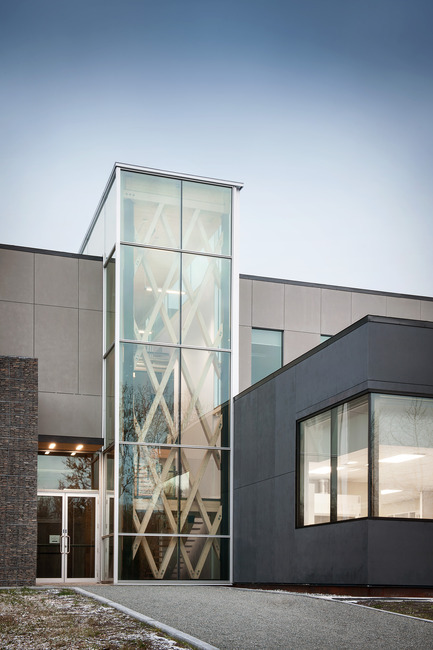 Tall curtain walls at either end face the Cégep to the east and the woods to the west, letting in morning light on one side and evening light on the other. 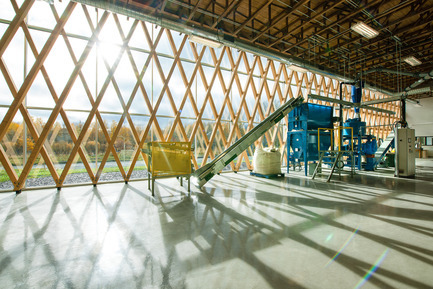 A glazed “Technology Showcase” on the south façade opens up the biomass lab to the outside and shows off the activities taking place within. 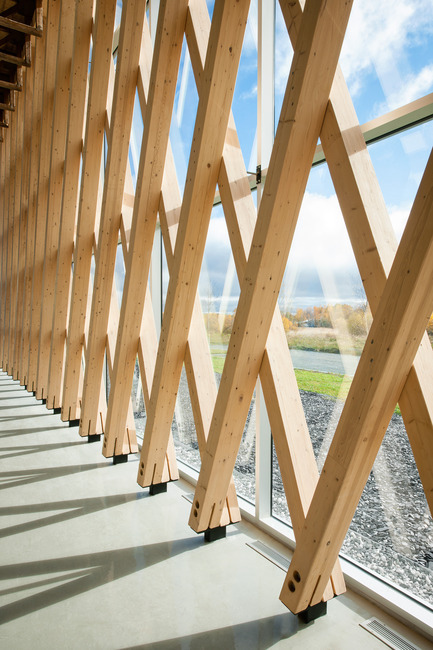 It features a unique structural lattice formed of diagonal laminated wood timbers, highlighting the ingeniousness and expertise of the heavy timber industry the region is known for. 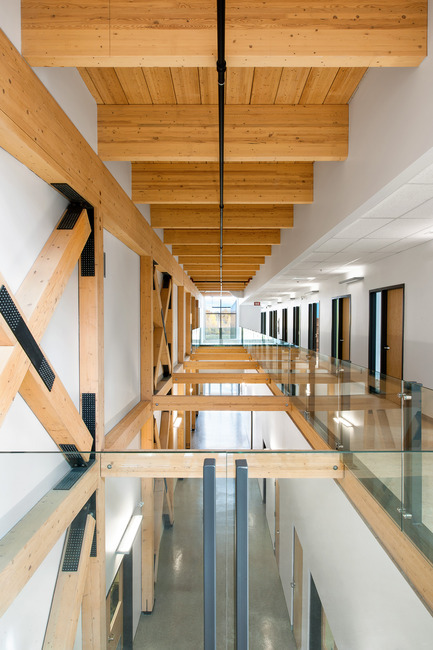 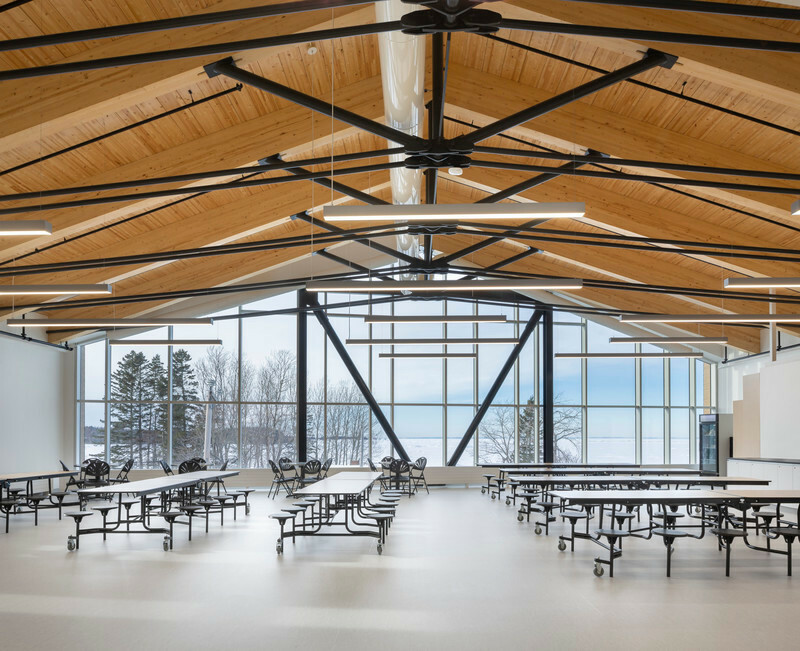 Both architect and client envisioned a building with a wood structure, but as the budget did not allow for heavy timber construction for the entire building, standard joists were used in several places. 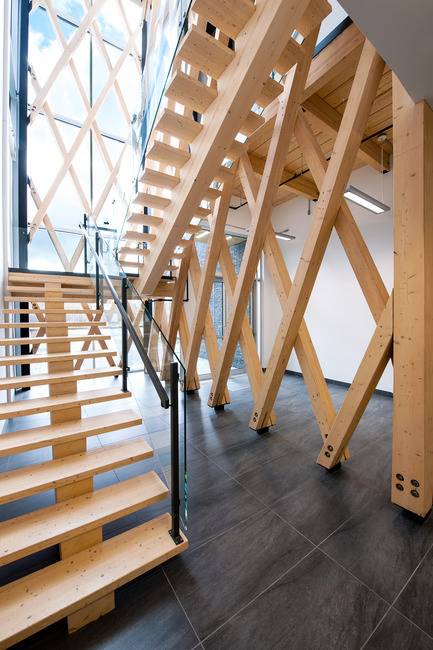 The structure also had to be designed to reduce transmission of vibration from the movement of the forklift which is used in some areas of the ground floor. 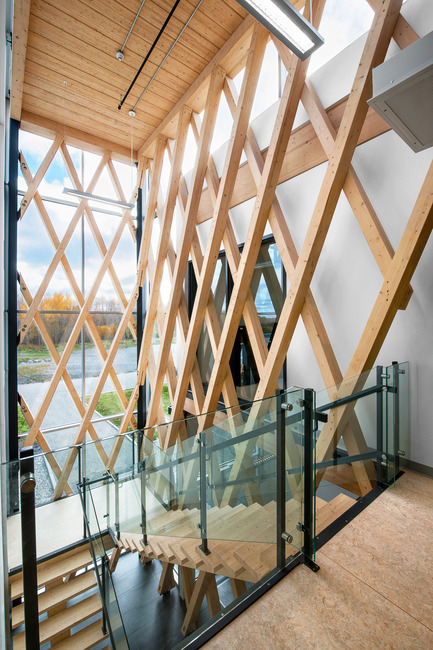 The glulam lattice structure and the stone gabion walls presented real challenges to both the designers and the builders of the project. 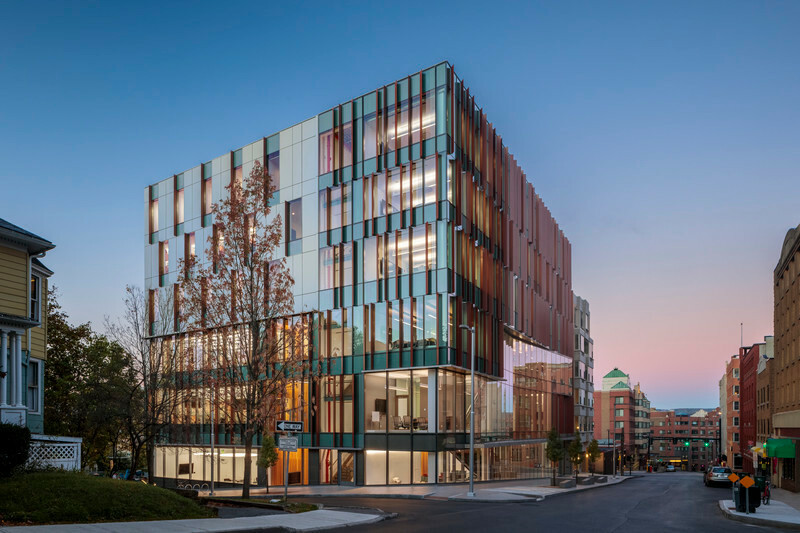 As the result of having met those challenges, the building's architecture is a physical representation of the potential of research and creativity to find new ways to use and add value to raw materials such as wood and stone. 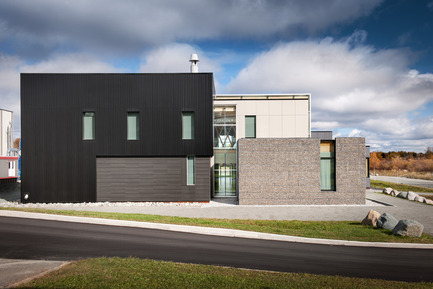 Several sustainable development features were integrated in the design, each contributing its particular challenges: a solar wall for fresh air pre-heating, geothermal wells for heating and cooling, a Digital Addressable Lighting Interface for advanced lighting control, retention basins for controlling surface water on site, maximized use of structural wood, and a high-performance building envelope.